The 2013-2014 regular season is over. For many fans and critics, whatever happened in those 82 games no longer matters nor will it be remembered. In Pittsburgh, when it comes to the Penguins, anything less than a Stanley Cup is considered a failure. That has been the case ever since Ray Shero became general manager and the Penguins won the Stanley Cup in 2008-2009. Since then, despite the team having one of the most talented rosters in the league, year-in year-out, they have only made it past the second round of the playoffs just once in four seasons. That's not going to cut it, not with the expectations that this franchise has. So who is the spotlight on the most? Well, of course you can say it's always on the team's captain, who happens to be the best player in the world and the current scoring champion of the league. That would be Sidney Crosby in case you couldn't guess it. Crosby always has the spotlight on him, no matter what game he's playing in. Last year, Crosby failed to tally one point in a four-game sweep at the hands of the Boston Bruins in the eastern conference finals. To be honest, that's simply unacceptable for the best player in the world. Hard to believe Michael Jordan going down like that in his prime. I'm sure Crosby would agree. Crosby seems to have been on a mission all year. He won the scoring title in the NHL, and helped Canada win the Gold medal for the second consecutive Winter Olympics. By the way, Crosby has scored a goal in each of the last two gold medal games. Crosby wants to be the best and wants to win the Stanley Cup, with the recent playoff failures the last four years, you have to believe Crosby is going all out and pulling off yet another epic performance. It was also nice to see Crosby get some much needed rest towards the end of the season. Who else? Well, there's the polarizing head coach, Dan Bylsma, who gets fired on social media on a daily basis. The fact is, the head coach of any team is one of the easiest targets when it comes to blaming. Byslma certainly has his flaws. His lack of using match-ups during games is certainly a part of his coaching repertoire that I could do without. Past examples would be not getting Crosby away from Zdeno Chara during last year's conference final, and not being able to get Evgeni Malkin away from Sean Couturier two years ago against the Philadelphia Flyers. Bylsma won the Stanley Cup with the Pens in 2008-2009 after taking over as interim head coach for Michelle Therrien. Since Bylsma has been the full-time head coach, the Pens are three-and-four in playoff series, which includes two first-round exits in back-to-back-seasons. For the record, Bylsma was out-coached badly in last year's conference finals, and against the Flyers the year before. Despite the humiliating loss to the Bruins last postseason, general manager Ray Shero decided to not only not fire Bylsma, but re-signed him to a multi-year deal. So far, bringing back Bylsma has been a great move by Shero. Bylsma coached a great season, helping the Pens finish second in the eastern conference for the second straight season. The Pens also won their division, despite having the most injured team in the entire NHL, totaling over 500 man-games missed due to injuries and illness. A lot of those injuries were key players as well, including Pascal Dupuis, Evgeni Malkin, Kris Letang, Paul Martin, Beau Bennett, and James Neal, all of whom missed 20-or more games. That in a year where the Pens already had the least amount of quality depth on the roster since 2006-2007. Bylsma not only pulled off another great season, but he also became the fastest coach in NHL history to win 200 games. His resume includes a Stanley Cup, fastest coach to win 200 games, and a Jack Adams Award for coach of the year, and that's with just five full seasons of experience. Maybe that's why Josh Yohe of the Tribune-Review told me the other night on our podcast that "If Bylsma were fired from the Penguins, at least five teams would call him in 15 minutes. ". I don't think that's farfetched at all. The players also seem to love him, as many have included him in their reasonings for signing or re-signing with the team. However, every coach has their shelf-life in the world of professional sports. Especially in the NHL, where we've seen teams have more than two coaches in one season. Hell, look at the Pens, who fired their coach in midseason in 2008-2009, just a season removed from a Stanley Cup finals appearance. That's how Bylsma got the job in the first place. Despite the fact that I've been told by multiple sources that cover the team that it would take "Something drastic" to happen for Byslma to lose his job, there is without a doubt a huge spotlight shining on him this postseason. If the team has another meltdown, it will be hard to argue replacing him with some fresh blood. Reports are that the Pens truly believe that Byslma is their guy, so I think if he at least gets to the conference finals again he's safe. 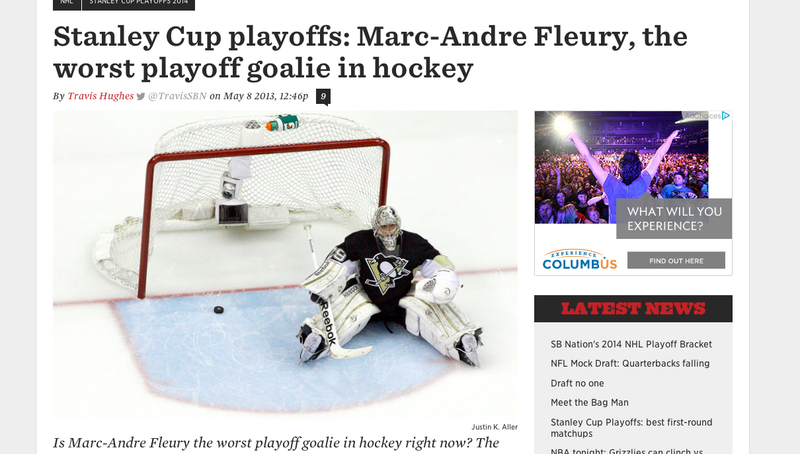 Speaking of being blamed for everything that goes wrong with the Penguins, I present to you Pens' goalie Marc-Andre Fleury. In football, the quarterback also gets the blame when the team loses, in hockey, at least in Pittsburgh, the goalie takes over that role. It seems that there are only two different crowds in the Penguins' fan-base when it comes to Fleury; one that blames every single goal on him, and the other crowd that comes to his defense every time a goal is scored. The truth lies somewhere in the middle. I can not defend Fleury's last two postseason performances. The team in front of him was extremely talented and he simply imploded. Two years ago, Fleury gave up 26 goals in just six games, which is an NHL record. Fleury followed that up with another brutal performance last year, allowing 14 goals in four games, and went 2-2. 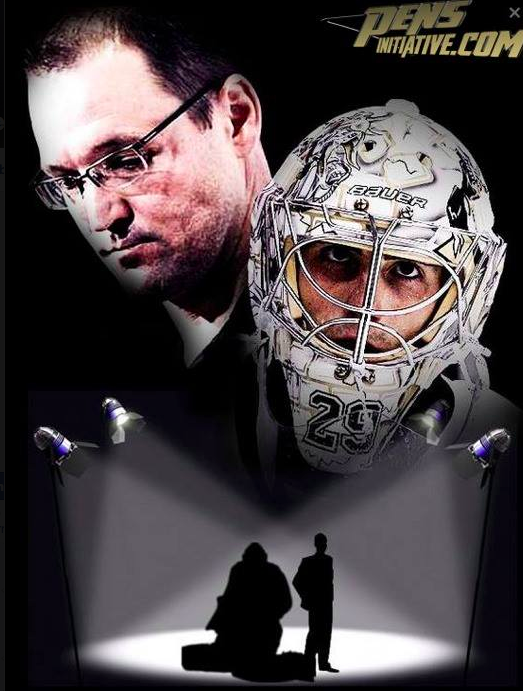 The Pens pulled Fleury in favor of Tomas Vokoun. Hindsight is 20/20, but it's hard to imagine the Pens getting to the conference finals the way that Fleury was playing. "There's always tomorrow" would fit with the Fleury story. Four straight playoff disappointments have caused the spotlight to not only be shining on Fleury, but for most Pens fans to feel uneasy, as they don't quite know what to expect from him in the 2013-2014 playoffs. There certainly is a reason for fans to be pessimistic when it comes to the French goaltender, however, there are also many reasons to think he can finally play up to his standards. Fleury is a good goalie, and one of the most talented goalies in the NHL. His resume and highlights speak for themselves. Fleury is a former All-Star and Stanley Cup champion, who has also won 288 regular season games before the age of 30. In the 2007-2008 playoffs, Fleury was incredible, helping the Pens reach the Stanley Cup finals while posting a magnificent .933 save percentage. In 2008-2009, Fleury helped the Pens win the Stanley Cup, and was lights out in the final two games against the Detroit Red Wings, only allowing two goals on fifty-one shots. Fleury was the hero in game 7, stopping 23-of-24 shots, including the infamous save on Nicklas Lidstrom as time expired. What Fleury will the Pens get this time around? Will they get the Fleury that seems to panic, that looks like a deer in headlights, giving up soft goal after soft goal? Or will they get the hero from game seven against Detroit? In the meantime, Fleury continues to be one of the best and most consistent goaltenders in the NHL during the regular season, but as we all know, the playoffs are what matters. Speaking to Mr. Josh Yohe, he told me that "The Penguins players and management have nothing but belief when it comes to Fleury" and that "Fleury looks completely focused and motivated", well the entire fan-base hopes so. Fleury has a real chance to redeem himself from his recent failures, but another one could end his up-and-down career in Pittsburgh once and for all. Kris Letang is a high profile player, even more so since he is only three games removed from being out of the lineup due to a stroke. Talking to people around the team, Letang is at no more risk of getting hurt than you or I. Letang takes a ton of heat in Pittsburgh, easily being one of the most consistently criticized players on the team. Add the fact that Letang was re-signed to a $58 million deal that kicks in after this season, and the stroke, and you have a player that will have a ton of eyes on him. It should be mentioned that Letang has looked incredible since he's returned to the lineup. He's definitely one of the best conditioned athletes on the team and arguably in the league. He's already shown how much he can help the Pens in their transition game; and by getting the puck out of their zone, which has been a huge problem for this team all season. The Pens do need some more offense from their blue-line, and Letang, who had 11 goals in just 37 games (On pace for 24 in 82 games) also had 16 points in 15 games last postseason, which is exactly what they need from him agains this year. Just maybe without the erratic defensive play. There is also worry that Letang will be targeted because of his stroke, which Bylsma has already came out and talked about publicly. Rob Scuderi was brought back for one reason, and that's to help the team play good defense in the playoffs. Scuderi was a hero for the Pens during the cup run in 2008-2009, and then left for free-agency. Scuderi then won another cup with the Los Angeles Kings, and re-signed with the Pens this past offseason. Scuderi has a bad year during the regular season, but he was brought in for the playoffs. If he falters, that contract is going to begin to look worse and worse. James Neal had an interesting season. He got suspended for five games, after he kneed Brad Marchand in the face. He was left off of Team Canada, and missed 23 games total. His discipline was earning him well deserved criticism and he's fully developed into a heel across the NHL. That being said, he is still a very productive offensive player, averaging over a point-per-game. I have heard rumblings that the Pens would be willing to trade Neal if the right deal came along, if Neal continues his negative ways, take bad penalties and making dirty hits, there's a chance he can play himself out of Pittsburgh.